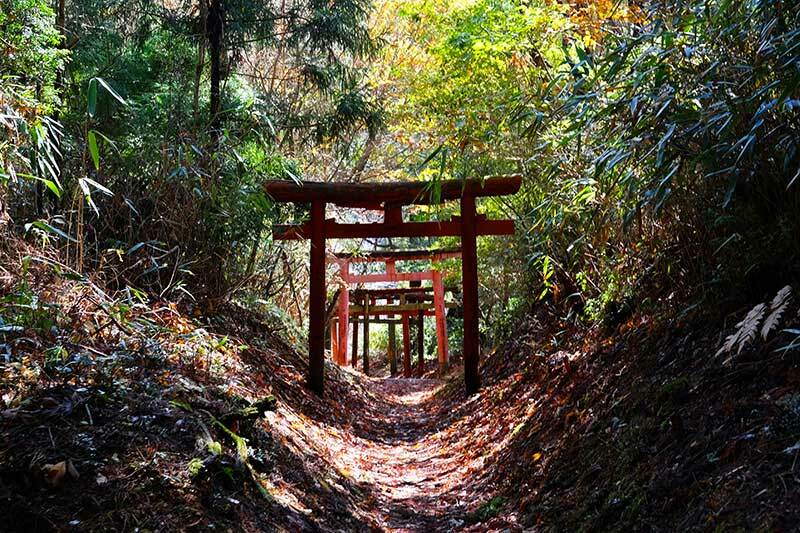 A self-guided, walking tour along the sacred Kumano Kodo Pilgrimage. 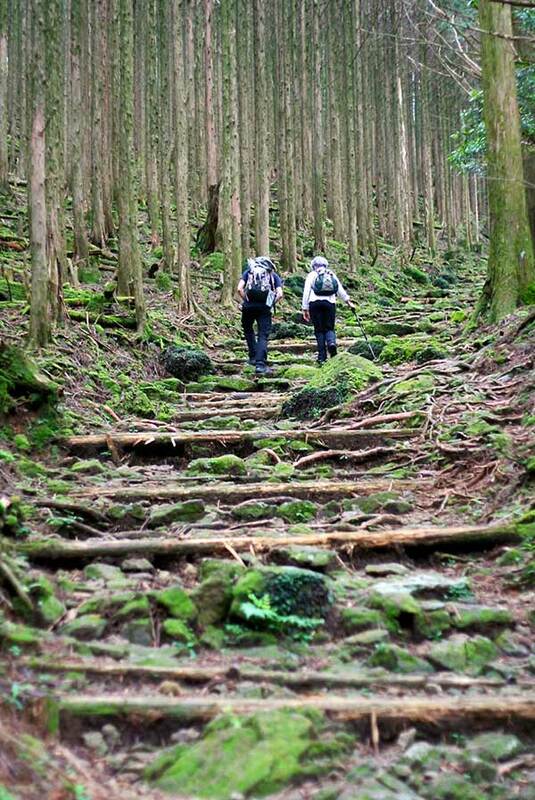 Self-guided walking on the Kumano Kodo, one of only two UNESCO registered pilgrimage trails worldwide. Follow ancient trails trod by pilgrims for over 1,000 years through deep, forested valleys in remote countryside; accommodation in hot spring hotels and inns, with plentiful local cuisine. The Kumano Wayfarer is a self-guided tour suitable for anyone who can walk for more than four hours in comfort. In general, the route is hilly and mostly follows forest trails. It includes some steep climbs and areas of uneven, rocky terrain. Please read more on Tour Levels here. 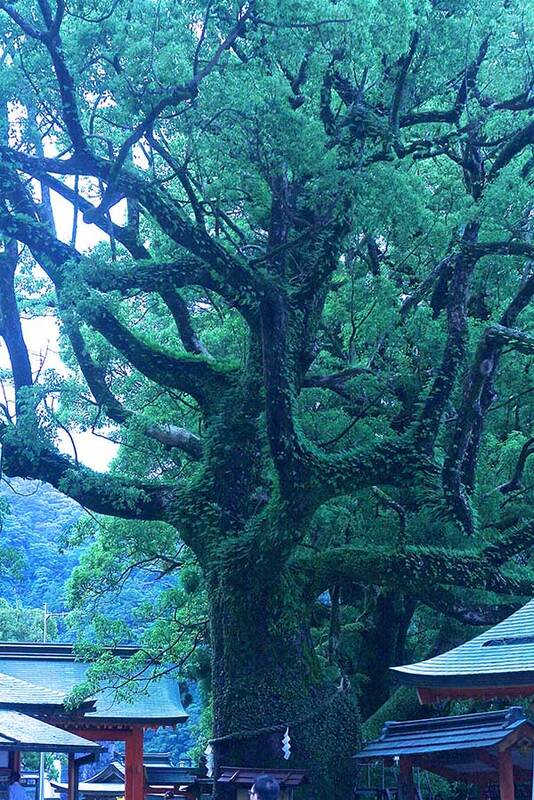 The Kumano Wayfarer is a 7-day, 6-night tour starting in Yuasa and finishing in Shingu. Tour accommodation is in Japanese inns and hotels. Group size is a minimum of one and a maximum of six persons. For more information please contact us. This is an unescorted walking tour following the Kumano Kodo, an ancient route travelled on foot by emperors, pilgrims and ascetic monks for over a thousand years. 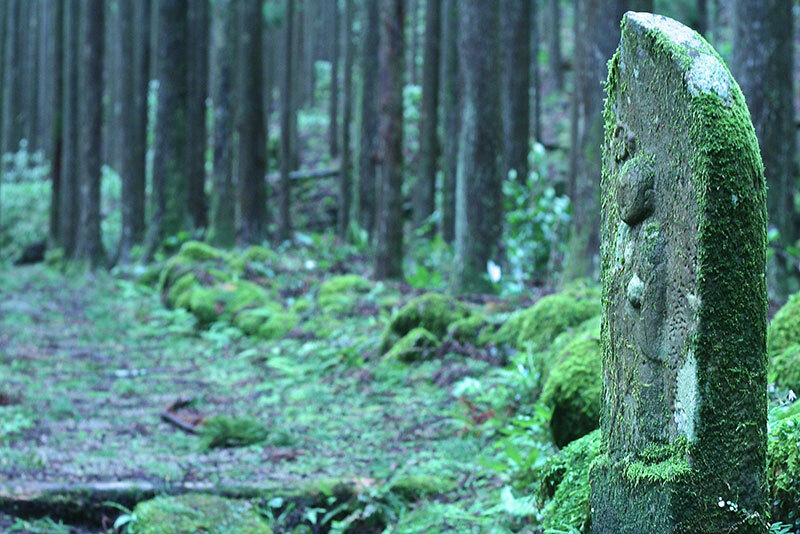 Drawn to Kumano’s message of universal acceptance, the devout would hope to attain spiritual rebirth in a landscape deeply connected to the Kojiki, Japan’s myth of creation. Today, pilgrims are few in number, but the route still remains an important part of Japan’s cultural heritage, cared for by those who live and work aside it. 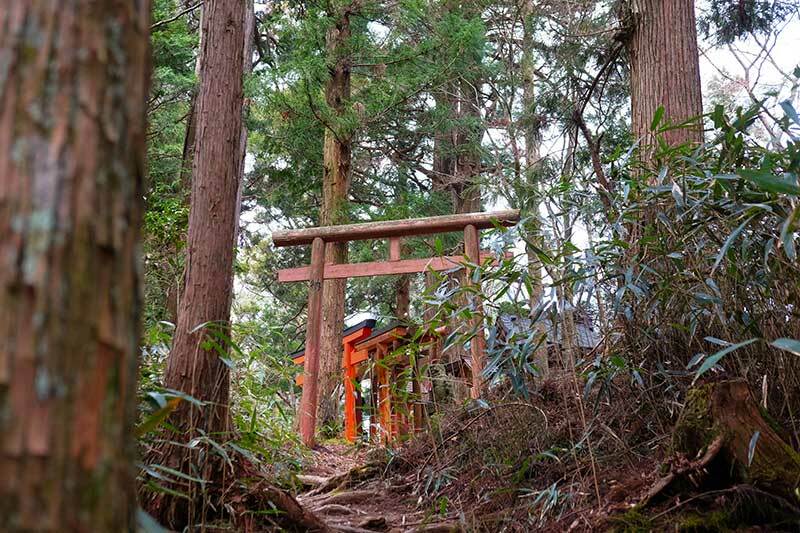 UNESCO has awarded the Kumano Kodo World Heritage status and, alongside Spain’s Camino de Santiago, it is one of only two pilgrimages in the world afforded this distinction. The tour starts on the Kii Peninsula at Yuasa, an attractive and historic town. Enjoy an afternoon strolling through its traditional streetscape or walking along a nearby section of the Kumano Kodo over a mountain pass. 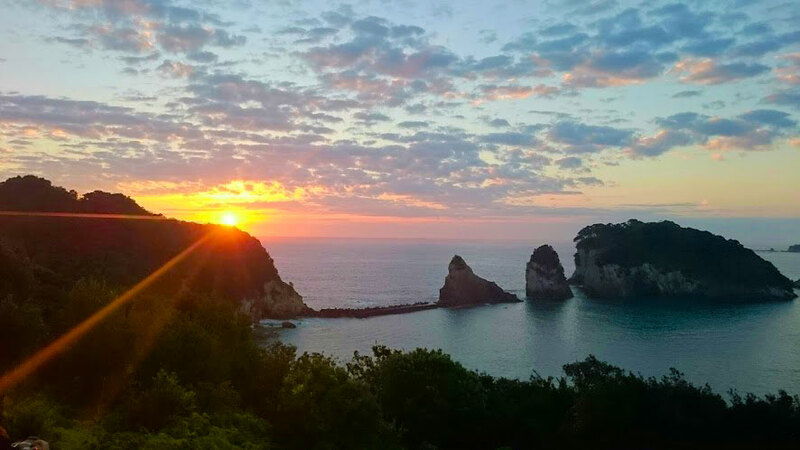 The following morning, transfer by train and private transport to the start of your walking along the Kumano Kodo’s Nakahechi route. This follows a hilly, winding path primarily through verdant forests that leads to the Kumano Sanzan; namely, Hongu Taisha, Nachi Taisha and Hayatama Taisha. All are sacred grand shrines at the core of the pilgrimage; the first is known for its scenery-dominating, immense torii shrine gate and the second for the iconic setting of its pagoda and waterfall. 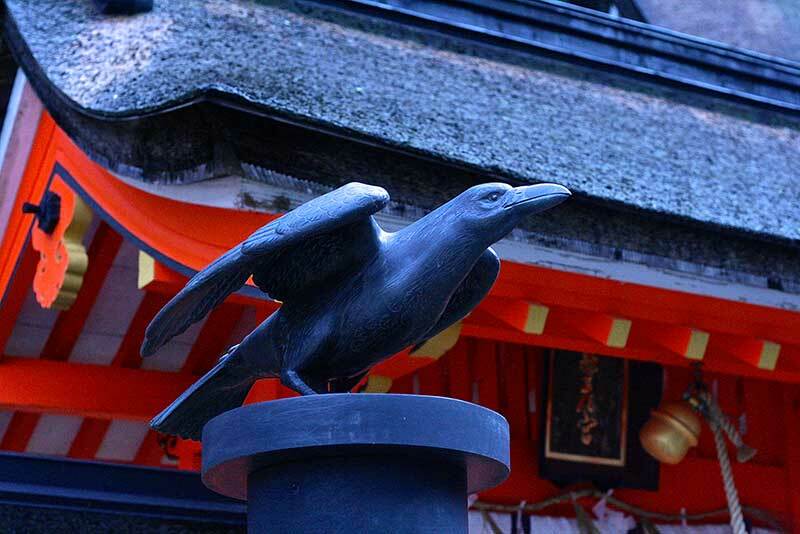 Your path, which leads you through charming villages, is lined with a multitude of oji sub-shrines, carved deities and other testaments to the historical and spiritual significance of the Kumano Kodo. 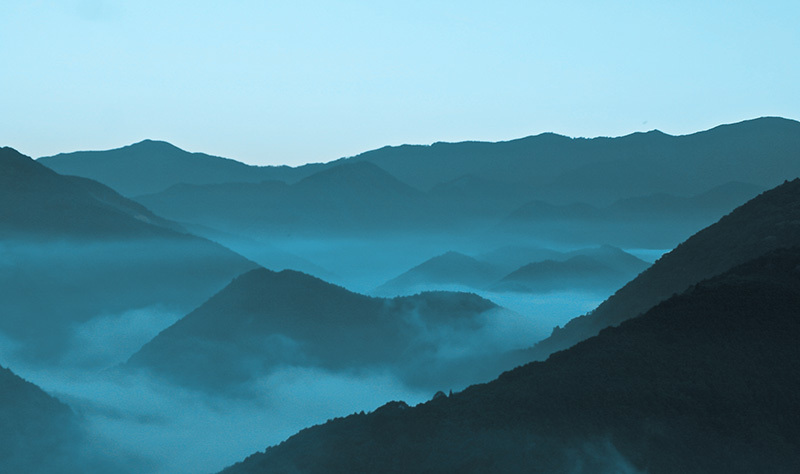 Occasionally, the forest opens up to reveal expansive, scenic mountain views, some over neatly tended tea fields and others to the Pacific Ocean. Accommodation is mostly in family-run inns, some with the distinctive and traditional Japanese surroundings of paper screens and straw mat tatami flooring. Japanese baths, sometimes with hot waters sourced from onsen thermal hot springs, are an excellent way to relax and luxuriate at the end of each day. 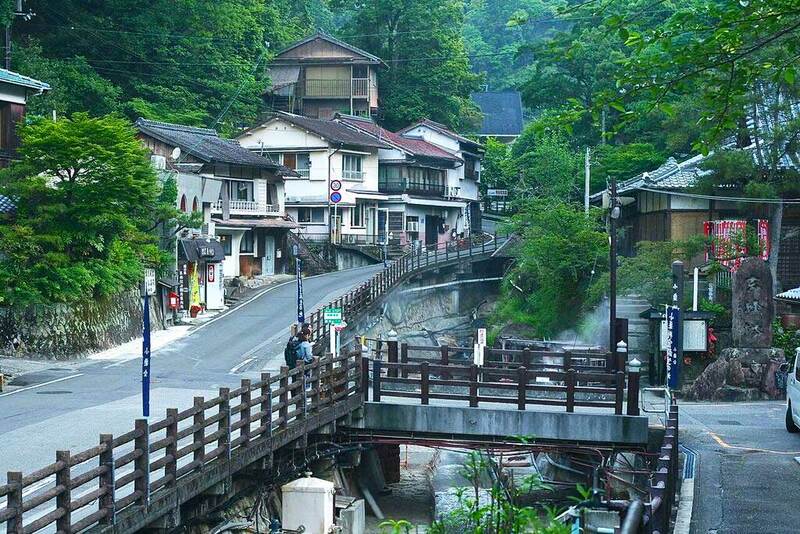 A special treat is a night at Yunomine Onsen, one of the most venerable hot spring villages found in Japan. Everywhere your hosts provide a warm welcome and feasts of home-cooked, regional cuisine, many of the ingredients of which they or their neighbours have grown or sourced from the surrounding forests. A Level 4 tour, the Kumano Wayfarer includes some steep, rocky climbs over uneven ground. The materials provided utilise Walk Japan's extensive research of the Kumano Kodo and its expertise derived from over 25 years of leading guided walking tours throughout Japan. We are confident that our Kumano Wayfarer provides an enjoyable and unique experience of the Kumano Kodo pilgrimage route, as well as an intimate experience of Japan and its people. The Kumano Wayfarer includes easy-to-follow, detailed instructions on how to join and prepare for the tour. Daily walking distances are between 10-25kms (6.2-15.5 miles) and elevation gain averages between 600-1,000m (2,000-3,300ft.). Options are provided to lengthen or shorten the daily itinerary to suit your energy levels. Several passes need to be negotiated along the route, sometimes over uneven and rocky terrain and care needs to be taken, especially on wet days. Wherever it is inconvenient to take on public transport, your main luggage will be transferred for you between accommodation. We provide two rail tickets for transport between Yuasa and Tanabe, and also for transfer at that end of the tour from Shingu to either Nagoya, Osaka or Kyoto. A Pre-Tour Pack. Each Pack should answer most, if not all, of the questions you may have and includes such details as how to prepare for your Wayfarer Tour, how to travel from your arrival point in Japan to the accommodation on the tour's first night, an accommodation list, and travel advice. Pre-tour Packs are sent as PDF attachments by e-mail no later than two calendar months prior to the tour start date but typically earlier than this, often upon receipt of a completed manifest form. A Wayfarer Route Booklet and Wayfarer Supplementary Information. The former, which is provided to you at your first night’s accommodation, is an easily portable small format book including detailed maps, photos, local site information (lunch recommendations, historical context, etc. ), and precise walking directions. Click here for a sample of the Wayfarer booklet. Click here for a sample of the Wayfarer Supplementary Information. 6-nights’ accommodation, 6 breakfasts, 2 lunches and 6 dinners. Main baggage transfer between your accommodation. Rail transport from Yuasa to Tanabe and from Shingu back to either Nagoya, Osaka, or Kyoto at the end of your tour. One reserved taxi transfer from Kii-Tanabe Station to the start of your walk. This transfer includes main luggage forwarding to your first-night accommodation. In-country (Japan), 24-hour English-language emergency support. Not included are flights, 4 lunches and drinks with meals, transfers other than those noted in the itinerary. Please see the Itinerary for this tour by clicking on the button found further up this page. 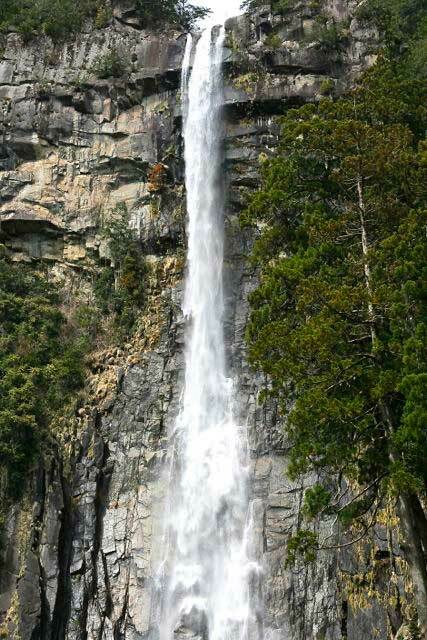 The itinerary for the Kumano Wayfarer Self-guided Tour is ground only beginning in Yuasa and ending in Shingu. Prior to the tour, Walk Japan will provide detailed instructions for travelling to your accommodation in Yuasa from Osaka’s Kansai (KIX) Airport, and Tokyo’s Narita (NRT) and Haneda (HND) Airports. Your tour begins with a stay in the quaint, countryside town of Yuasa, located on the western coast of the Kii Peninsula and a charming town famed for being where shoyu soy sauce was first brewed. After checking in at your traditional Japanese accommodation, enjoy a stroll around the Yuasa’s picturesque streets and include visits to the Edo Period (1603-1868) shoyu brewery and an early 19th Century era public bathhouse, which now serves as the local museum. 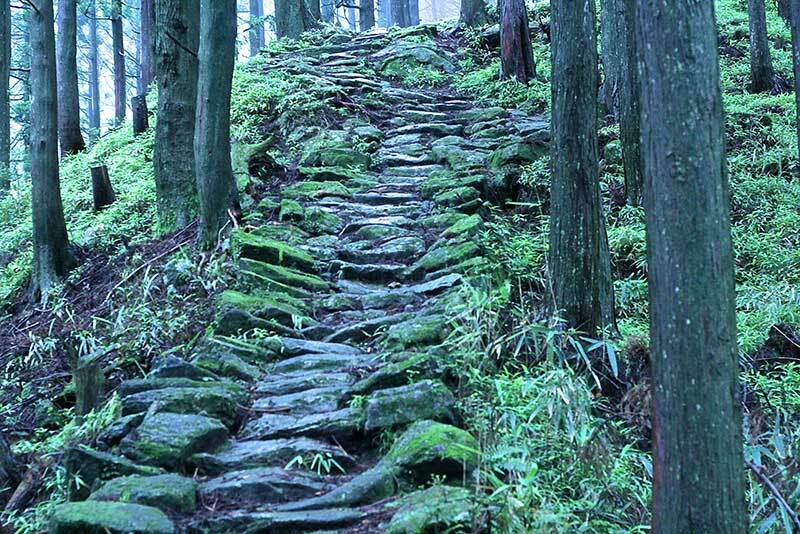 For those arriving early and with sufficient energy, a walk on the Kumano Kodo’s Kii-ji route, up and over a nearby mountain pass is recommended. In the evening, enjoy a relaxing and leisurely soak in the onsen hot spring baths in your accommodation before feasting on a delicious, traditional meal created by your hosts. Total walking: (Optional 7.5km (4.7 miles). Total elevation gain: (Optional 177m (580ft). Transfer by train using the tickets included in your tour to Kii-Tanabe Station, where a reserved vehicle awaits your arrival to transfer you to the start of your walk at Takijiri, deep in the Kumano countryside. 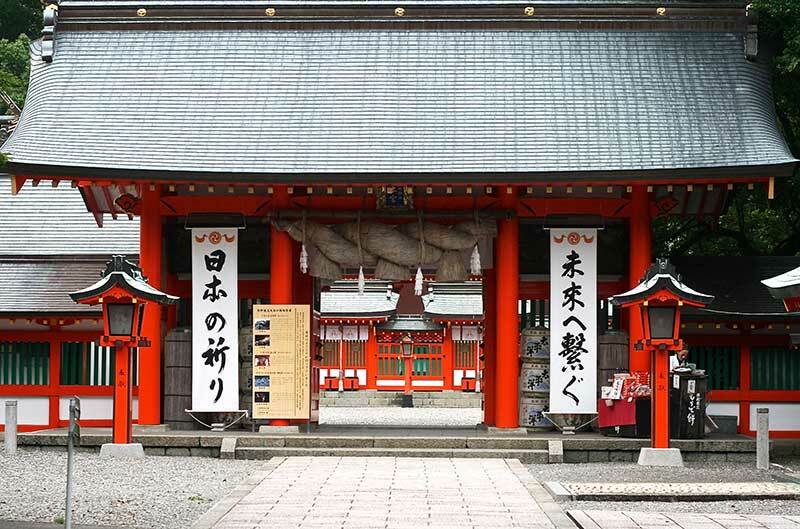 If you wish, start your travels on foot by purifying yourself at Takijiri-Oji Shrine the Japanese way with water and a prayer. 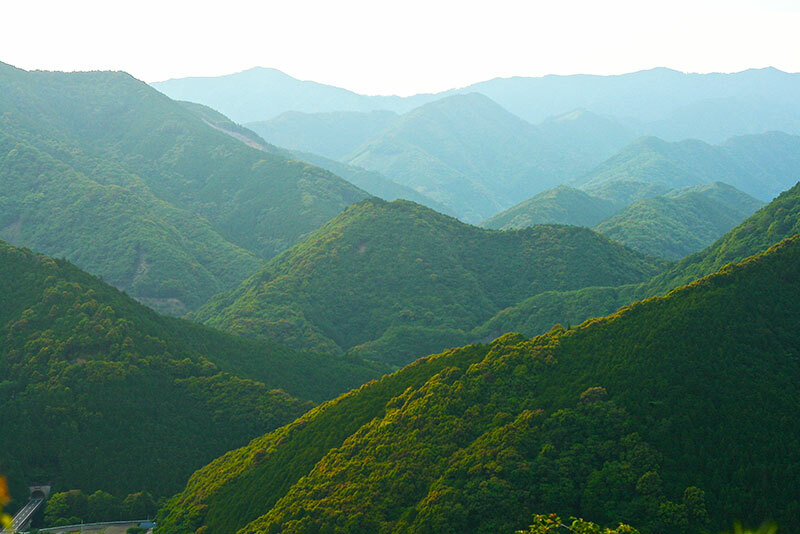 The Nakahechi section of the Kumano Kodo begins here with a steep, rocky ascent. This takes about 90 minutes but you reach the top in the knowledge that it is one of the harder sections of the tour and also that the walk for the rest of the day is much easier. As you make your way up, the first of numerous remnants of the pilgrimage route’s spiritual hey-day, including sutra mounds and Buddhist statues help mark the route. From the top the path follows much gentler, undulating terrain to your destination at Takahara, a delightful mountain-side village. A bonus for negotiating this first climb are the mountain views that open up at the top. The accommodation tonight provides more panoramic views from its terrace and bedrooms over the valley below and across to the mountains of Kumano. Your hosts also provide a warm welcome, soothing baths and an evening feast of local produce. Total elevation gain: 396m (1,300ft). Enjoy breakfast in the inn before setting out to re-join the pilgrimage. Immediately leaving Takahara the route delves once again into forest, climbing gently past the site of a long disused teahouse. Other reminders of this once popular route, including an ichirizuka distance marker, line the way. A long descent leads you to a remote, roadside restaurant in time for lunch. The local delicacy, mehari-zushi, found here is made from rice and mustard leaf and is highly recommended for taste and to satiate the stomach. A short ascent brings you to the crest of the Hashiori-Toge pass. Here at the top is an unusual stone statue of a noble riding both a horse and cow. Descend along a cobbled path and staircase to Chikatsuyu, a small village where you may restock on supplies, break for coffee and chat to the friendly locals. If you have time a visit to the local modern art museum is worthwhile for the architecture alone. Designed by world famous Sanaa architectural firm, this small and intriguing museum holds temporary exhibitions of modern and traditional art. The final stretch of walking today takes you on a short, ascent to Tsugizakura-Oji, famed for giant cedar trees and a thirst-quenching spring. Your accommodation tonight, a small inn, is run by a friendly husband and wife team, known locally for their cooking prowess. Total walking: 13.0 km (8 miles). Total elevation gain: 703m (2,306ft). Forest paths connecting remote mountain villages and many panoramic views of the surrounding countryside feature today, the longest section of the tour. The route climbs over a number of passes before arriving at Fushiogami-Oji, where pilgrims once prostrated themselves on catching their first glimpse of the Hongu Taisha grand shrine, which presides over the valley below. The walking is all down from here to the grand shrine, unless you include a short diversion up to a scenic viewpoint along the way. In contrast to its torii gate, which is an imposing structure towering 33.9 metres high, the Taisha is composed of simple, elegant buildings that are seemingly at one with the surrounding, verdant forests. There are two ways of travelling from here to this evening’s accommodation at Yunomine Onsen, a village set in a valley, either easily by local bus or with much more exertion on foot over another stiff pass. There are many onsen thermal hot spring baths in Japan and around the world but only one, found at Yunomine Onsen, that is registered as a UNESCO World Heritage Site. This is in a small, innocuous hut found aside a stream in the centre of the village. 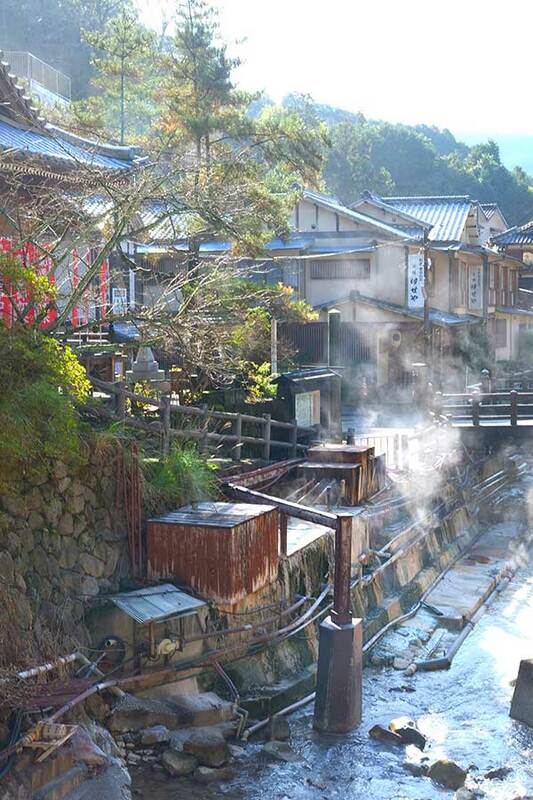 Onsen were once used for purification rituals in preparation for visiting the Hongu Taisha. They are also a great way to relax after a day’s exertions. Your inn has its own atmospheric baths to be luxuriated in before a grand, multi-course evening meal. Total elevation gain: 737m (2,418ft). Time to explore Yunomine Onsen after breakfast. Later in the morning, walk up to Hyakken-gura, which provides some of the most spectacular views of the tour, which extend back over Kumano. The trail continues on a forest track and eventually descends into Koguchi, an isolated village surrounded by mountains and rivers. Your accommodation tonight is basic but comfortable and your hosts are, as ever, friendly and serve hearty, local food. Total walking: 14.5km (9 miles). Total elevation gain: 602m (1,975ft). An early start after breakfast for today’s walk, which begins with a 2.5 hour ascent that rises 800 metres. Here you are more likely to encounter pilgrims as this climb coincides with the Saigoku Kannon 33-Temple Pilgrimage of Western Japan. The path, through forests and along ridges strewn with ancient, moss-laden boulders, makes this a more challenging day. However, the surroundings, which exude a strong sense of the almost pre-historic, spirituality of Kumano, make the effort very worthwhile. Later, expansive views open up over mountains to the steely-blue Pacific Ocean. 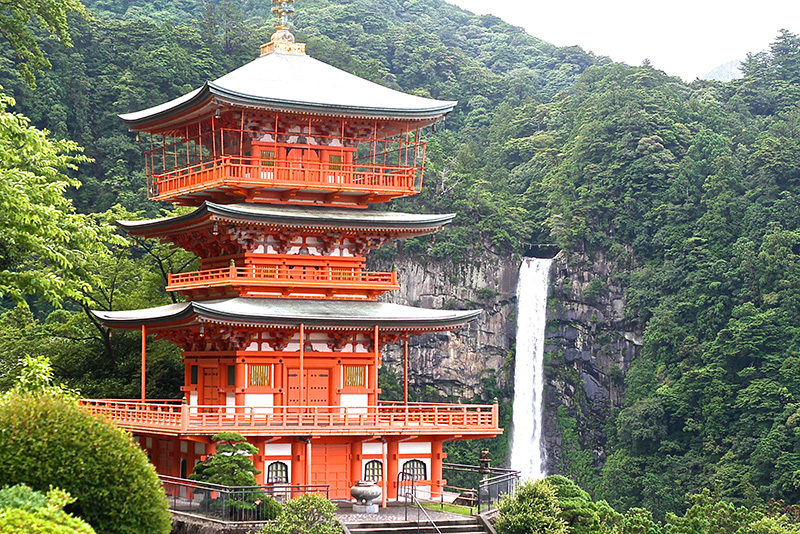 From here a descent brings you to the Nachi Taisha grand shrine and to one of Japan’s classic views, a pagoda with a backdrop of the Nachi-no-Otaki, waterfalls that plunge 133 metres. The final section today to Katsuura is completed in a relaxed fashion by local bus. Situated on the Pacific Ocean coast, Katsuura is well-known in Japan for the fresh tuna brought to auction at its early morning market. Transfer across the harbour on the regular shuttle boat to the onsen hot springs situated aside the sea. Relax here before enjoying a final evening feast at your accommodation. Total walking: 15km (9.3 miles). Total elevation gain: 1060m (3,478ft). For those who rise early, before breakfast, you may like to visit Katsuura’s early morning fish market, the largest fresh tuna auction in Japan. Note, however, that the auction is closed on Saturdays and public holidays, and when the weather prevents the fishermen from leaving harbour. After checking out, ride a local train to nearby Shingu, where Hayatama Taisha, the last of three Kumano Sanzan grand shrines, is found. A final climb up a short but very steep set of steps, leads to Gotobiki Iwa, a giant rock that is revered as a natural deity. Your tour finishes here and tickets are provided for your return train journey from Shingu Station to either Nagoya, Osaka or Kyoto. Please contact our customer service staff well in advance if you require information about travel to other destinations in Japan. Total walking: 5km (3 miles). Total elevation gain: 90m (300ft). The itinerary for the Kumano Wayfarer Self-Guided Tour is ground only beginning in Yuasa, and ending in Shingu. The airport closest to the tour's start at Yuasa is Osaka’s Kansai International Airport. The tour may also be joined from both Tokyo’s Narita and Haneda International Airports, Nagoya’s Chubu Airport, and Fukuoka Airport..
Limousine Bus express coaches run to JR Wakayama Station. A ticket is JPY1,150 and the journey is approximately 40 minutes. The transfer from Wakayama to Yuasa is on the JR Kisei Line, the fare is JPY670 and the journey approximately 40 minutes. At Yuasa, either walk or take a taxi to your accommodation. Note, if staying in Osaka prior to the tour, an easy train transfer may also be made from Shin-Osaka or Tennoji Stations on the Limited Express Kuroshio JR train. The total journey is approximately 1.5 hours and the fare is between JPY2,600-3,400. Keikyu trains depart for Shinagawa Station. Transfer here to the Shinkansen bullet train for Shin-Osaka. At Shin-Osaka transfer to a direct Limited Express Kuroshio train to Yuasa. The total journey is approximately five hours and the fare approximately JPY16,000. JR Narita Express trains depart for Tokyo Station. Transfer here to the Shinkansen bullet train for Shin-Osaka. At Shin-Osaka transfer to a direct Limited Express Kuroshio train to Yuasa. The total journey is approximately six hours and the fare approximately JPY18,000. Tour participants are advised not to book themselves out on an early morning flight at the end of the tour on Day 7, as the tour does not end until approximately mid-day in Shingu. The journey from Shingu to the nearest international airport takes approximately 4 hours. The tour includes reserved seat train tickets from Yuasa to Kii-Tanabe on Day 2 and at the end of the tour on Day 7 to either Nagoya, Osaka or Kyoto. Please let our Customer Service team know your preferred onward destination or, if you are unsure, enquire about which destination may best suit your post-tour plans. Single supplement: Available on a limited basis at JPY32,000. Please contact us for more details. Included: 6 nights' accommodation; 6 breakfasts, 2 lunches and 6 evening meals; luggage transfers; Wayfarer Route Booklet and Supplementary Information; 2 rail tickets; one pre-booked taxi transfer; in-country (Japan), 24-hour English language emergency support. Group size: Minimum one person, maximum eight persons. Start date: Subject to accommodation availability, it is possible to start Wayfarer tours on any date.